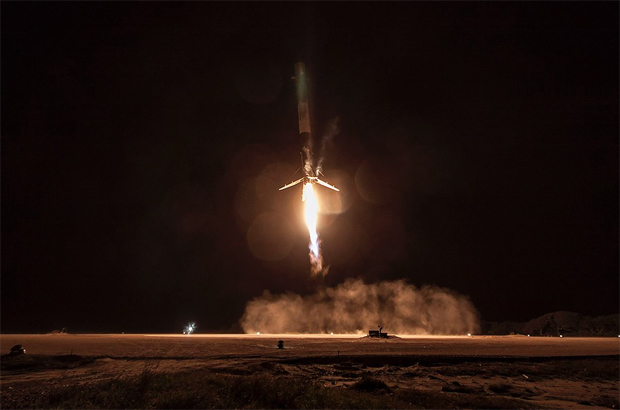 From a purely technical perspective, the successful re-entry and powered touchdown of the Falcon 9 stage represented a "ground-breaking accomplishment," said former NASA Administrator Mike Griffin. "The ability to examine the stage after it has survived the stresses of flight, to put it through qualification and flight acceptance tests to verify and gain confidence in its condition, is the first step toward economical re-use of the launch vehicle," he said in an email exchange. "Further, the demonstration of supersonic retrograde propulsion -- restarting an engine in supersonic flight and using it to fly back home -- is important to future attempts to land large, heavy payloads on Mars. This was a marvelous flight test, the first step along an important road." The successful landing "could be very significant, and the conditional is because we have to see what's required to refurbish and relaunch this stage," Logsdon said in an interview. "It was an important first step. You can't re-launch until you recover (the hardware). So showing you can recover it is a big deal." The Falcon 9 rocket blasted off Monday evening from the Cape Canaveral Air Force Station, making SpaceX's first flight since a catastrophic launch failure last June. The primary goal of the mission was to boost 11 Orbcomm data relay satellites into orbit, which was successfully accomplished within about 20 minutes of liftoff. But SpaceX had two other major objectives. First, the company put an upgraded version of its Falcon 9 to the test for the first time, using cryogenic propellant cooling and "densification" to increase launch thrust. And, of course, the company carried out the first successful landing of a rocket stage used to help boost a payload to orbit. "SpaceX has to find out how close to launch ready it is upon return, how much processing are they going to have to do before it's ready to operate in the launch environment again," he said. "And that's an unknown. "I think the business case depends on launching frequently. There has to be costs of refurbishment. I remember seeing Elon in a ceremony once, saying his goal is just to have to pay for the fuel for the second flight. ... But it will be a while before he can do that." During his conference call Monday night, Musk said a Falcon 9 currently costs about $60 million to build and launch. But propellants only account for about $200,000 of that total. And that, he said, "means that the potential cost reduction over the long term is probably in excess of a factor of 100." "I think this is quite significant," he said. "I do think it's a revolutionary moment. No one has ever brought a booster, an orbital-class booster, back intact. ... We achieved recovery of the rocket in a mission that actually deployed 11 satellites. I mean, this is a fundamental step change in technology compared to any other rocket that has ever flown." Wayne Hale, a former space shuttle ascent-entry flight director and post-Columbia program manager, called the successful landing "a very impressive technological achievement." "Kind of the holy grail is if you can reuse a space vehicle, you then can bring the costs down," he said in an interview. "The trick is going to be in refurbishing. That's where we didn't make the mark in space shuttle, because the refurbishment of the shuttle was so expensive. (The Falcon 9) is a simpler vehicle, we're really just talking the engines, some structure and the plumbing." But rocket engines are high performance machines with little margin for error and "whether or not this is a really practical thing to save money depends on how much work goes into refurbishing them," he said. "That's kind of the key thing. It could save a lot of money, or wind up like the shuttle and not save anything." But, he added, "let's applaud the accomplishment. It was a really spectacular technological accomplishment. Whether or not they can make the business case work depends on the next step." Joan Johnson-Freese, a space policy analyst and professor of national security affairs at the Naval War College, was less circumspect, calling the landing "a very big deal." "Washington is pretty much littered with space transportation studies that say the only way that space is going to open up as a regular development area is through reusability," she told CBS News. "It's taken us 50 years to get there, but I think we're a step closer now." "The only entity that can take this kind of risk is probably a private company," she said. "The space transportation field, I think, has been moribund because no government has (been able) to take the kind of risk needed to make this kind of really exceptional push forward." Amazon founder Jeff Bezos also is developing reusable rockets. His company, Blue Origin, successfully launched and recovered a sub-orbital New Shepard rocket during a test flight last month. The presumed "space race" between the two billionaires has triggered widespread chatter in social media circles even though the rockets currently in operation or development are not in competition. After the successful New Shepard test flight, Musk tweeted his congratulations, but went out of his way to point out that Bezos' rocket was strictly sub-orbital and did not have to endure the same stresses as a Falcon 9 first stage returning from an orbital mission. "Jeff maybe unaware SpaceX suborbital VTOL (vertical take off and landing) flight began 2013," Musk tweeted. "Orbital water landing 2014. Orbital land landing next." After the Falcon 9's successful landing Monday, Bezos tweeted "Congrats @SpaceX on landing Falcon's suborbital booster stage. Welcome to the club!"